The activity appears focused on abuse of social media, through American-looking posts and sites, instead of big cyberattacks or disrupting voting systems. So far, it's more modest than the influence campaign Russia is accused of carrying out in 2016, and Russia is not alone - it's just one source of online manipulation ahead of Tuesday's election. 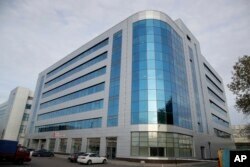 FILE - A business center building known as the "troll factory", an Internet Research Agency, one of a web of companies allegedly controlled by Yevgeny Prigozhin, who has reported ties to Russian President Vladimir Putin, in St. Petersburg, Russia . The proposed operating budget she oversaw was more than $35 million from January 2016 through June 2018 - including $10 million for the first half of this year, the complaint says. In recent days, its focus has been on the migrant caravan weaving through Latin America, on tight congressional races - and on an effort to recruit Megyn Kelly, whose show on NBC was canceled amid controversy over her comments on blackface Halloween costumes. Even after the February indictment by U.S. authorities of a dozen Russians linked to the Internet Research Agency, it continued to work on tricking U.S. audiences - including seeking to mobilize activists to participate in street demonstrations.